We are looking for new team members to join us in developing a novel public database that will compile exhaustive evidence of the Kremlin’s influence networks in Europe. For three months, selected Fellows will contribute to policy papers and analyses addressing the Kremlin’s influence networks in Europe. The Fellowship is primarily intended for applicants from Eastern Europe and Central Asia, but is open to candidates from other regions as well. Twitter is banning the methods used by bots and trolls to spread false stories on the network. Twitter users will no longer be able to post identical messages from multiple accounts or use software to perform other simultaneous actions. 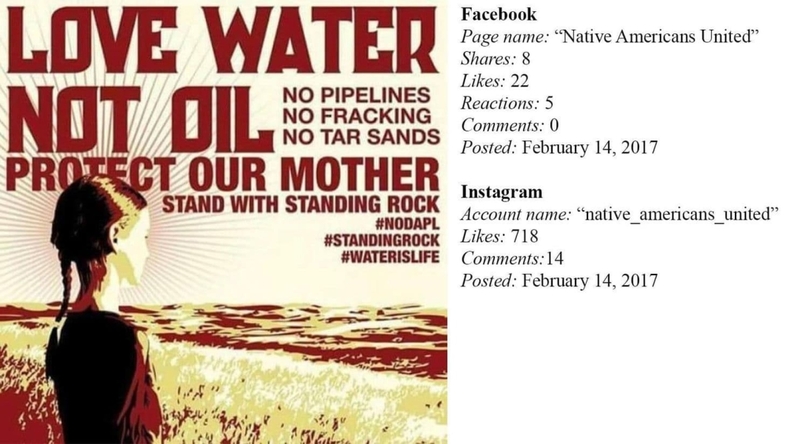 A new report by the US Congressional House Science, Space and Technology Committee presents previously undisclosed social media posts showing how Russian trolls sought to inflame tensions over issues including climate change, fracking, and the Dakota Access pipeline. Russian think tanks and GONGOs that are less blatantly propagandistic enjoy good relations with Western researchers. According to a survey conducted by the Boris Nemtsov Foundation, 40% of Germany’s Russian minority only watches Russian TV and considers it to be the most trustworthy source of news. Alina Polyakova and Spencer P. Boyer of the Brookings Institute have published a new paper describing how the techniques of political warfare are evolving and represent a cheap and effective way to influence domestic affairs in foreign countries. They highlight that the threat will only increase in coming years and include a set of suggestions and recommendations for governments on preventing further meddling. The authors call for more government cooperation with the private sector, but also encourage deterring countries like the Russian Federation in non-conventional ways. According to the study, “Western governments should develop a strategy of deterrence against political warfare with clearly defined consequences for specific offensive actions.” They should also “take a principled public stance on attribution”. Carolina Vendil Pallin and Susanne Oxenstierna of the Swedish Defence Research Agency focus on one of the Kremlin’s typical tools of spreading influence abroad – think tanks and GONGOs. They present nine case studies about organizations like the Russian Institute for Strategic Studies, the Dialogue of Civilizations, and the Information Security Institute. According to their findings, those organizations which are less inclined towards pro-Kremlin advocacy activities usually retain “the best relations with Western researchers”, and often enjoy invitations to conferences and other events in the West. 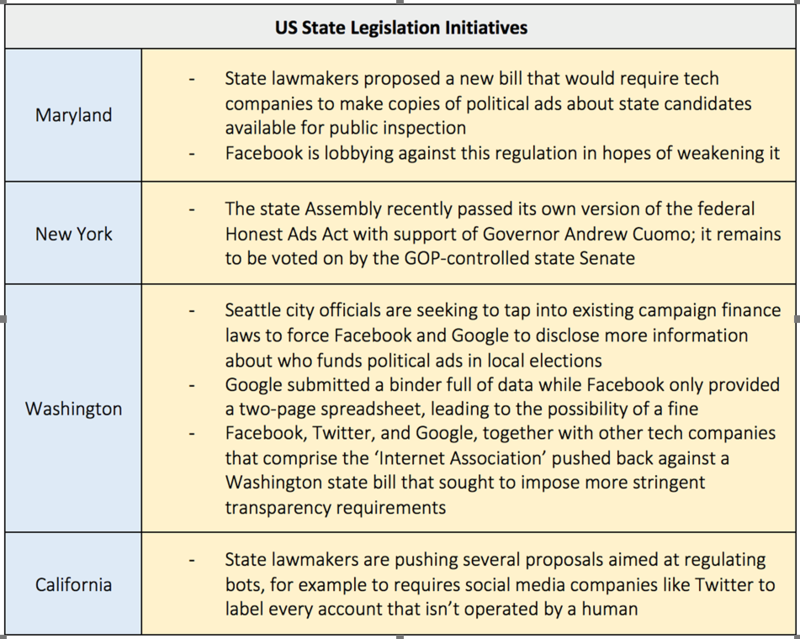 Although Congress has held numerous hearings over the past year with Facebook, Twitter, and Google regarding Russia’s influence efforts during the 2016 election – and even threatened regulation – no meaningful action has followed. For example, the Honest Ads Act (a bill to impose ad-transparency requirements on web platforms, introduced by Democratic Senators Mark Warner and Amy Klobuchar) has not been formally debated in the five months since its introduction. Local policy-makers and their supporters hope that action at the state level will slowly spur change at the national level. 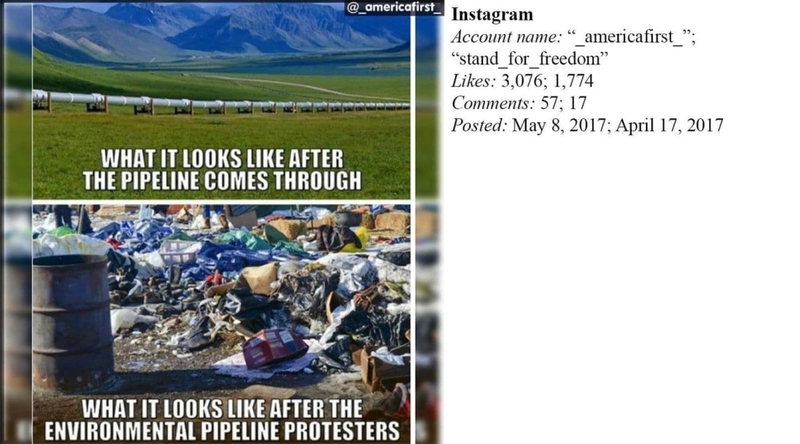 Confirming that Russian social media manipulation extends beyond the 2016 presidential election, the House Committee on Science, Space and Technology has published a new report that presents previously undisclosed material showing how Russian trolls sought to exacerbate tensions over sensitive partisan issues such as climate change, fracking, and the Dakota Access pipeline. The report found that between 2015 and 2017, 4,334 Facebook, Twitter, and Instagram accounts controlled by the St. Petersburg troll factory (Internet Research Agency) produced more than 9,000 posts and tweets pertaining to US energy and climate policy. It also highlights how Russians exploit both sides of controversial issue debates in American politics: the posts in question alternately assumed environmentalist and climate-skeptic viewpoints. Last week, we reported that Twitter is banning the methods used by bots and trolls to spread fake content. Facebook has now announced that it will employ a staff of 20,000 to monitor content for disinformation by the end of 2018 – double the current number. Sheryl Sandberg has publically vowed that the company is taking steps to fight fake news, including hiring teams of third-party fact-checkers and increasing the transparency and security surrounding political ads that feature on the platform. She also acknowledged that Facebook is “definitely playing catch-up, and we acknowledge that. But we are working hard to get ahead and stay ahead.” Here’s to hoping! For a more in-depth discussion of the challenges facing social media companies in tackling disinformation, we recommend this article in Mic. The National Rifle Association (NRA) is facing increasing scrutiny over its Russia ties – specifically its relationship with prominent Russian banker and close friend of Vladimir Putin, Alexander Torshin. Torshin is known as US conservatives’ ‘favorite Russian’ – he is a paid lifetime member of the NRA and an ardent gun-rights activist. Coincidentally, he has also been accused of money laundering and other financial crimes by the Spanish government. Torshin is currently under investigation by the FBI about whether he illegally funneled money to the NRA to help sway the 2016 presidential election in favor of Donald Trump. The NRA allegedly spent an unprecedented $55 million on the election campaign, the majority of which derived from a sector of the organization that isn’t mandated to disclose donor identity. Notably, Torshin was invited by American gun-rights activist Kline Preston to attend the 2012 presidential election as an international observer. Preston, who is a conservative lawyer and has done quite a bit of business in Russia, also introduced Torshin to NRA president David Keene in 2011. In 2015, Torshin tweeted: “I was there at Obama’s last election! The NRA card, to me as an observer from Russia, opened access to any [polling] station.” Through the NRA, Torshin was also invited to attend a national prayer breakfast in February 2017 with newly-inaugurated President Trump. Notably, his longtime assistant Maria Butina was also one of several Russians to attend Trump’s inaugural celebrations. One can easily guess last week’s leading man in the Russian media. It was Vladimir Putin (surprise, surprise!) announcing the development of “invincible” new weapons. The Internet reacted immediately. Most Western observers noted that Putin’s speech sounded like the opening of a new chapter in the arms race. The speech received extensive international coverage, evident from a detailed overview by Vzglyad, which noted happily that “the West takes new Russian capacities very seriously”. It’s the dream of a Russian imperialist come true: the world is watching us, the world fears us! While Vzglyad was working hard to feed Russians’ sense of national pride, RT chose a different line, emphasising that it wasn’t Russia that started a new arms race, but rather the United States. In fact, in his interview with NBC, Putin said that the U.S. “provoked” Russia twice: Putin blamed Washington’s 2002 withdrawal from the 1972 Anti-Ballistic Missile Treaty (ABM Treaty) for escalating the confrontation. “If we are to speak of an arms race, then an arms race started precisely at that point”. In the years following, the US has encircled Russia with its missile defense installations, extending its anti-missile shield to Romania and Poland, deploying for the first time a battery of Patriot long-range anti-aircraft system to Lithuania for war games. Seeing what an important role Russian minorities play in countries like Ukraine and the Baltics, it is crucial that every state with a Russian diaspora is deeply tuned in to their respective minority. A good example of such knowledge is the older but still very topical survey of Russians in Germany by the Boris Nemtsov Foundation, which focuses on issues such as social integration and media use, as well as attitudes towards democracy, Europe, minority groups, and Russian foreign affairs. One of the main findings of the survey is that four out of five respondents feel integrated in German society, with age and language skills being the most influential variables. 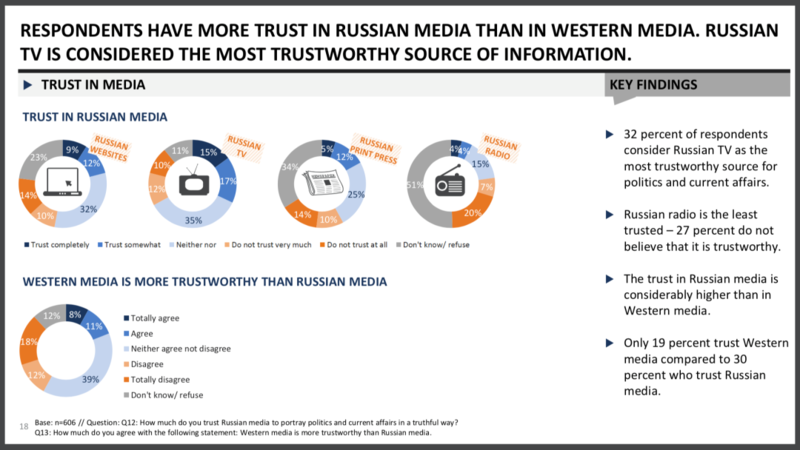 In addition, although most respondents learn about current affairs from both German and Russian language sources, 37% of Internet users only visit Russian speaking sites, and 40% of TV consumers only watch Russian TV, which they also consider to be the most trustworthy source of news. In general, trust towards the Russian media is considerably higher than towards Western media. At the same time, respondents are significantly more satisfied with democracy in Germany than with democracy in Russia, and, interestingly, gender equality is considered to be the most important characteristic of democracy (even more important than, for example, free opposition). More than half of the respondents have very limited knowledge about the EU, and nearly every second respondent believes that the West is prejudiced towards Russia. Many more interesting findings are to be found in the survey!